Logan just turned 18 months. 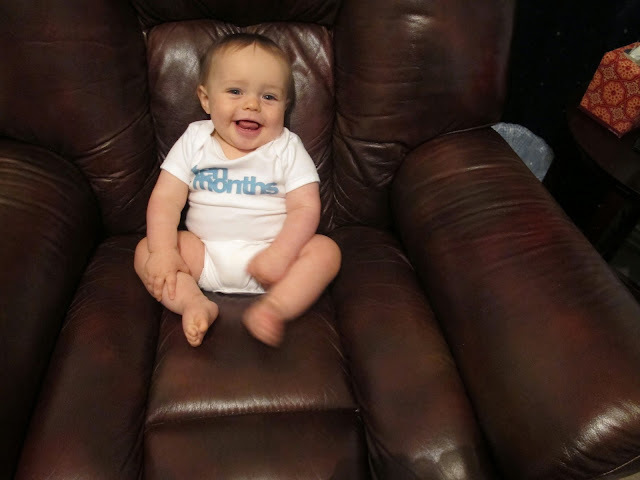 I tried to write about my little Guy these days. He's a full blown toddler now & still as cute as a button. He has grown up & changed so much in such a short time. He went from saying around 5 words to having a pretty good vocabulary right around Christmas. He learns new words everyday! Please, Thank you, More, Milk, I'm sorry, Nene (Dehne), Eat, & Shhh. Socks, shoes, diaper, ball, night night, bye, off, hi, mama, dada, dog, blue, yellow, green, car, fish, teetee, poopoo, graham cracker, Ki Ki, Na, Pampa, Pops (says Bop), Granna (says Nehna) Bear Bear (says bubba), RaRa, call, no, yes (& will nod head), go, circle, star, I love you (says wov ooo), drink (says conk), bottle (says baba), uh oh, uh oh Spaghettio (says uh oh doe doe), light, banana (says nana), applesauce (says aaapple), bath, moon, backpack, book, outside (says side), says cheese & smiles when you take his picture, & he will repeat several words that he may not know the meaning of. I'm sure there are more words he says that I'm not thinking about. 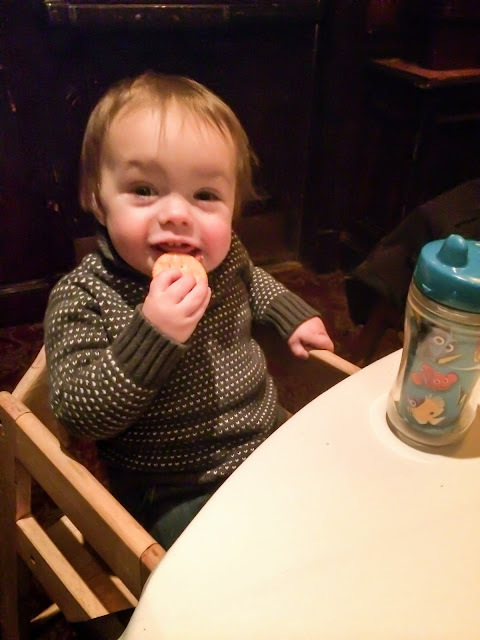 He loves crackers of all types, but his favorite are cinnamon graham crackers. He loves to brush his teeth (by himself). 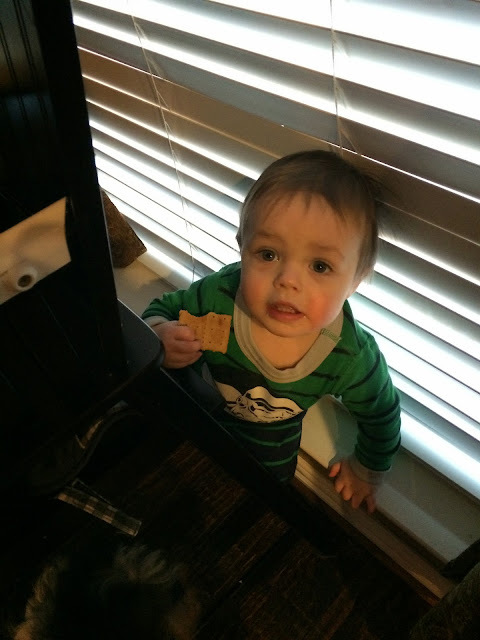 He plays with balls of any kind, likes cars, pushes his lawn mower & shopping cart around the house, loves climbing on everything especially the back side of his highchair, the windowsill, & the kitchen chairs. Loves Frozen, The Lego Movie, The Lorax, The Incredibles, Aladdin & Mickey Mouse. He loves bathtime. He plays with his wooden shape stackers & shape sorters. He will carry around a Rubik's cube when he sees one. 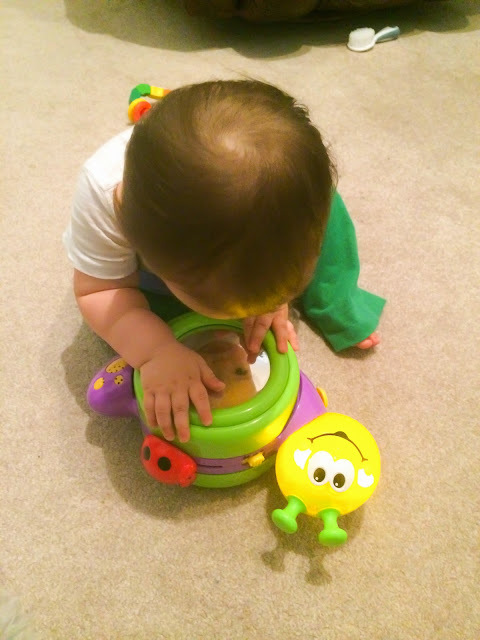 He loves his light up turtle that teaches him colors & shapes. He will dance & spin around when he's excited. He rides his Thomas train but not every day. He drags his ball pit around the house & climbs in it to play. He tries to sing but nothing intelligible yet. He loves to be sung to. He asks to call Ki Ki or Na every single day. He loves the keyboard & banging on things with his drumsticks (or anything that makes a loud sound). He can make a mess in 0.2 seconds. A big mess! He loves to turn lights on & off. He points at airplanes & tries to say airplane. He loves to play outside. 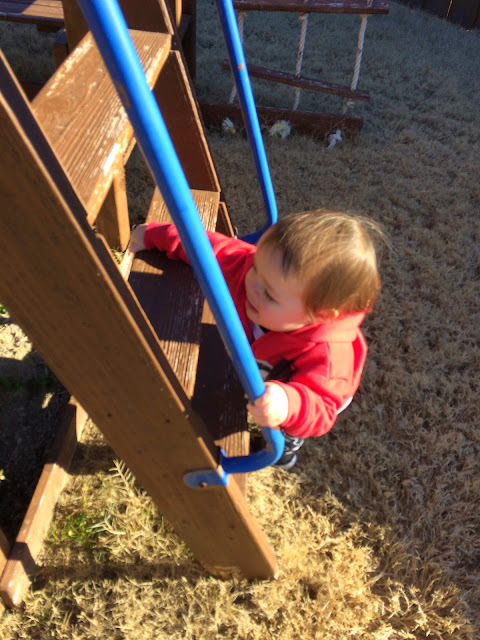 He swings, climbs the ladder, & slides down the slide (all with close supervision of course). He loves watching Snoopy do tricks or run around & play with his toys. He calls Snoopy "doggie". He's a mama's boy for sure, but he will go to most people he knows. He gives big hugs & still loves to be rocked & cuddled. He loves to play with hair & it soothes him to have his hands in mama's hair. He goes to bed around 8:30 & sleeps all night until we wake him around 7. He will sleep until 8:30 on weekends. I love my Logan more than I ever dreamed! He is a sweet little boy & will always be my baby. Logan's top two front teeth finally broke through his gums. They are just tiny slits right now...not actually protruding from his gums...but hopefully this means he will have more than two teeth sometime soon! 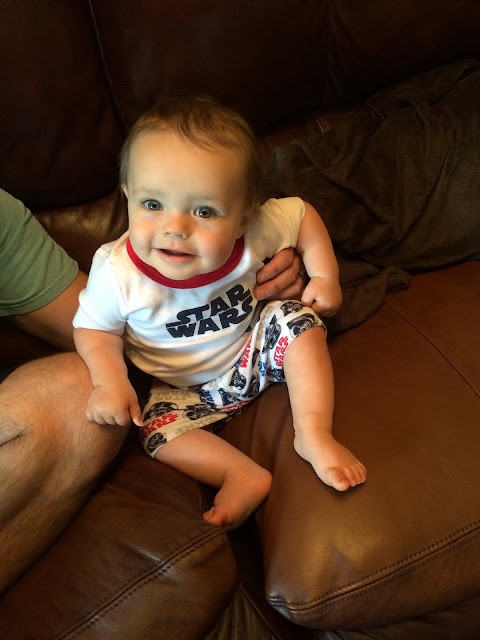 I am also in love with his Star Wars pjs! 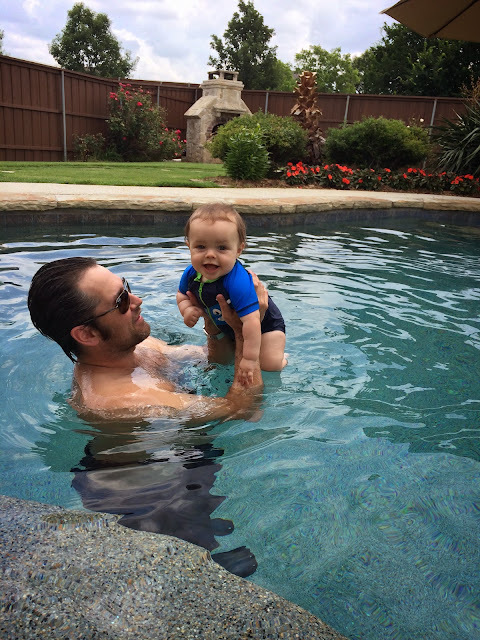 Last weekend we were able to swim in our pool for the first time this year! 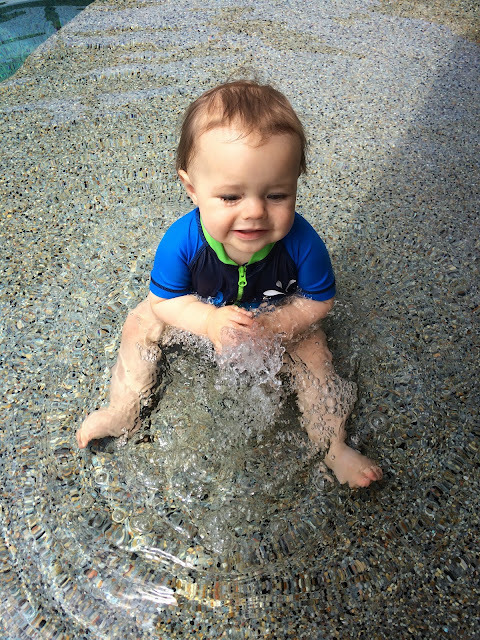 It was Logan's first time in our pool and he seemed to love it. This was the first of many pool days to come. I had a little fun and took some pictures of Logan and Barrett last week. Here are some of my favorites! These stuffed animal pictures are special to me. Looking at them brings back memories from my childhood. Tiffany and I played with dolls and stuffed animals together all the time. I have a picture of me and Tiff with a bunch of our dolls. I had fun setting this up! 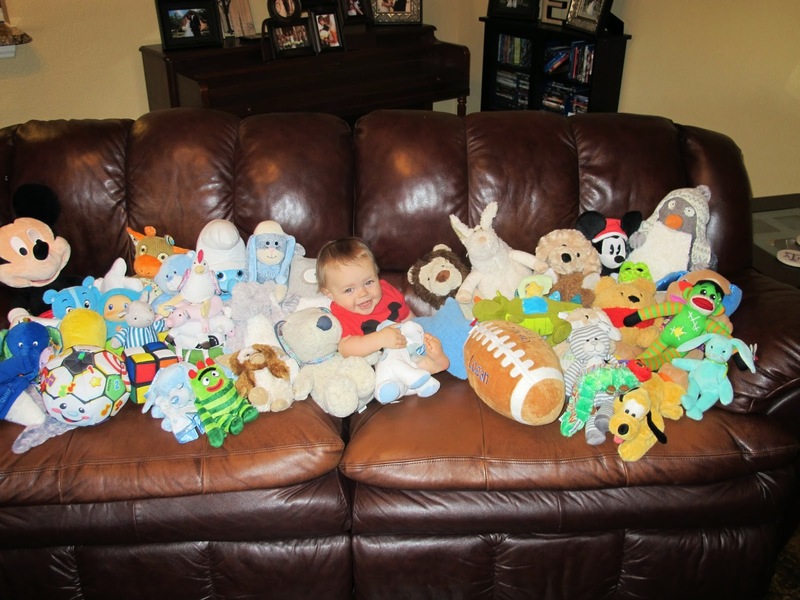 Cousin Barrett came by and we couldn't buy a smile while he was sitting with the stuffed animals! He's still adorable though! We tried to get a picture of them together but they were having NONE OF IT! Here is one of Logan in front of our bookcase. Of course we couldn't resist bringing our boys outside to take a few pics. I got a few of Logan with our beautiful flowers and finally got a big smile out of Barrett on the slide. Eye Color: Blue with a greenish ring around the center. Hair: His hair is long and soft. It is light brown with a hint of a reddish tone in the sun like mine. 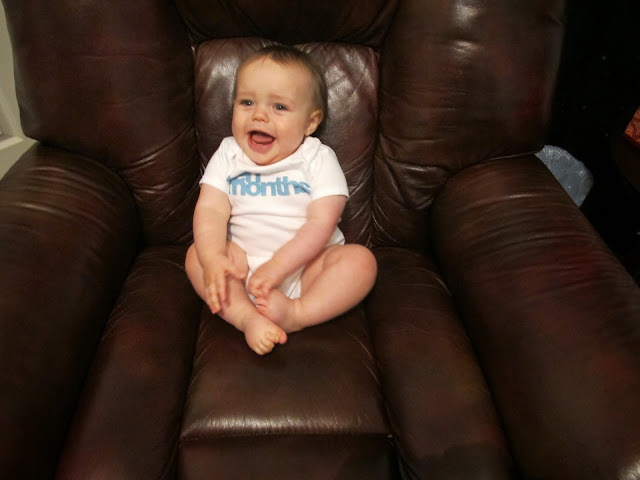 Clothes: He is wearing12 months in most clothes. 9 to 12 month pajamas & 12 month clothes. Diapers: He is in size 4 diapers. 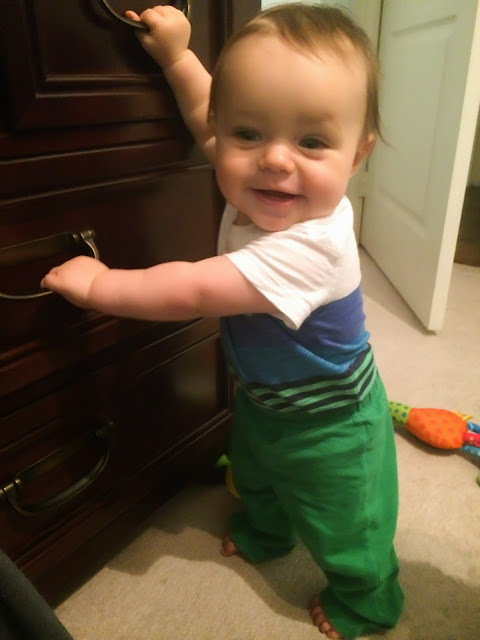 Milestones: Logan has started pulling up to standing by himself! 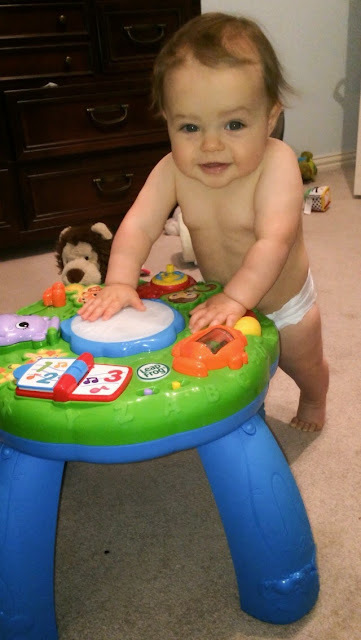 He pulls up on his play table to push all the buttons. He is crawling all over the place but still keeps his belly on the floor most of the time. 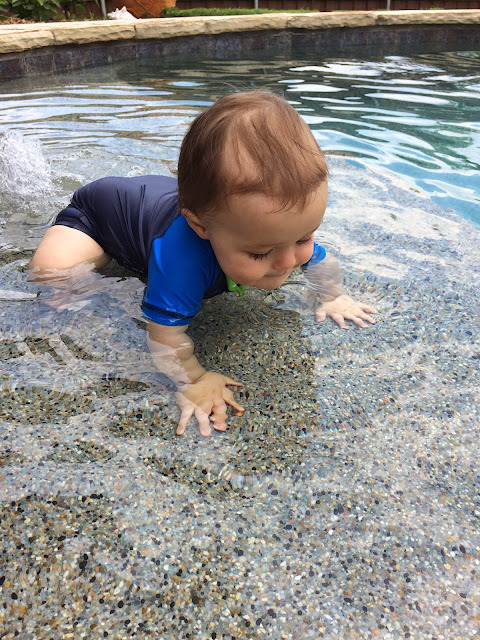 He can crawl on his hands and knees but is faster with his belly down so he drops down to get where he wants to go. His top two front teeth are pushing against his gums making them swollen but still haven't come in. His favorite word is Dada...he says it all the time and hardly says Mama anymore. He will occasionally say Hi and has said bye bye a few times. 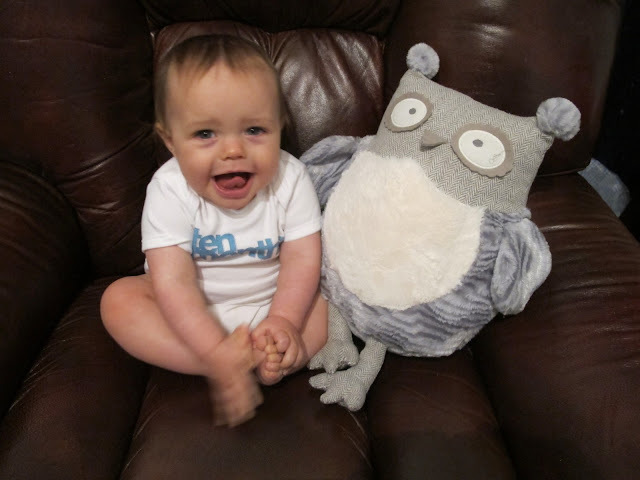 Mostly he just babbles and squeals like a pterodactyl. He has gotten a lot more verbal but is still often silent & observing. Sleeping: He usually sleeps around 10 hours during the night without waking up. He has been going to bed by 7:30 or 8. His naps are getting better. He usually gets one nap in the morning at daycare for around an hour & one good afternoon nap at home for an hour or two. Eating: He is still breastfed. He eats about 4 to 5 oz per feeding (of pumped milk while I'm at work). He also has three meals of food a day and at least one snack (puffs or yogurt) He has started eating more table food and less baby food. His favorites are chicken noodle soup & sweet potatoes. His least favorites are pears and apples, but he has started tolerating more fruit. Activities: Logan is a busy little guy! He no longer just sits and plays with toys...he now crawls everywhere! He often follows me when I leave the room and tries to pull up on my legs. He has started trying to pet and grab Snoopy. I've managed to get Snoopy to "give kisses" to Logan by licking the bottom of Logan's foot. He loves this and will either give me a huge smile or giggle. A few days ago Snoopy licked Logan's foot to make him stop crying! So sweet! He is still very smiley and usually happy. There isn't anything I wouldn't do for this little guy...he is my heart!! 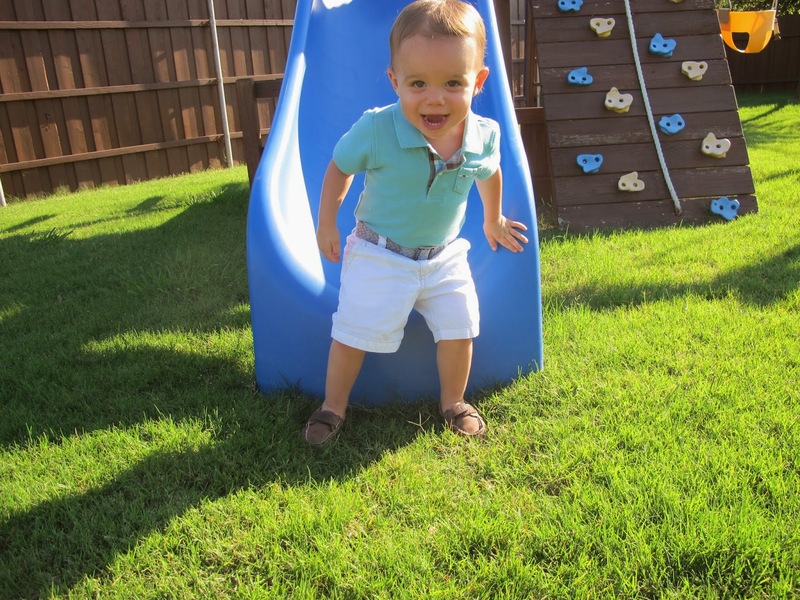 Logan has started pulling up to standing by himself! 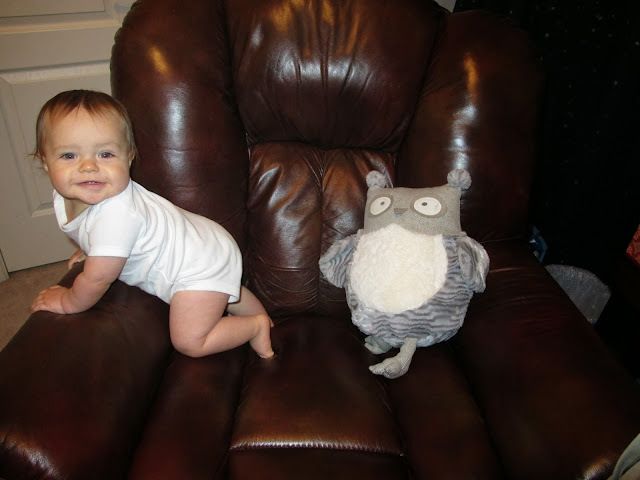 I think he had no interest in doing this until he started daycare and noticed the other babies standing and walking. He just started his third week of daycare. 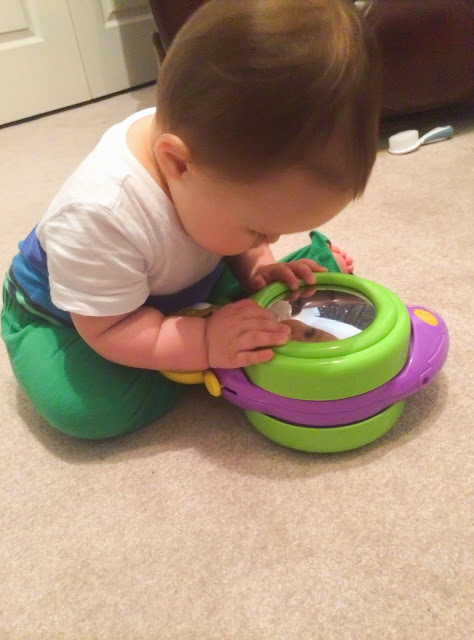 He is growing up and learning new things every day. I love every minute I get to spend with my little guy! He always finds something new to do or check out. 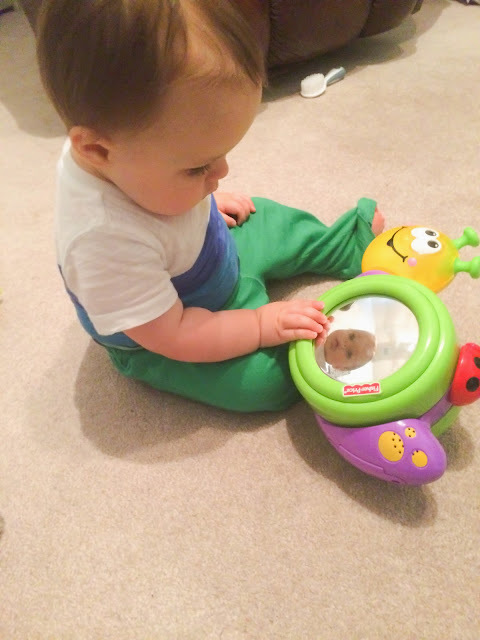 Yesterday it was his reflection in the mirror on his snail toy. He was fascinated by it!